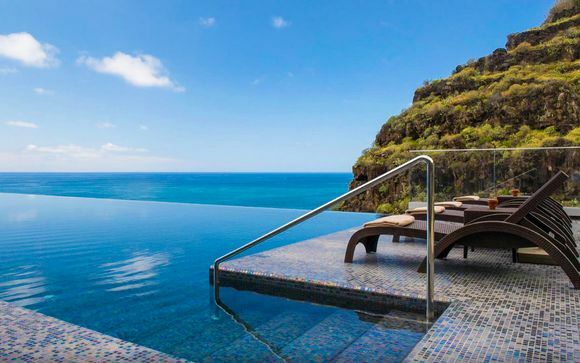 Madeira, Portugal free vacation guide up to -70% off To take advantage of these offers, join now for free! 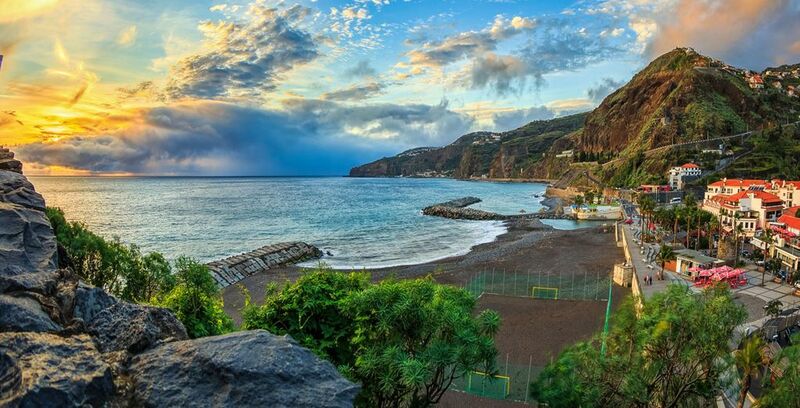 Discover Madeira, a beautiful island in Portugal. Get inspired with our Travel Guide . Advices, Tipes, Best location, itineraries and more ✅. The archipelago of Madeira is made up of four islands and is situated in the North Atlantic Ocean, off the north-west coast of Africa. The island of Madeira itself is one of Europe’s most beautiful holiday destinations and known for being a haven of outstanding natural beauty filled with wonderful fauna and flora, including the UNESCO World Heritage Site of Laurel Forest. The island is famed for its cultural and historical significance and there are a host of museums and galleries in the capital city. It is also known for the superb wine and gastronomy it produces. With an all-year-round summer climate, cities to explore, rustic villages, mountains and breath-taking walks, Madeira has something for everyone making it a popular holiday choice for the 1.4 million visitors it attracts every year. It is also one of the safest places to visit in Europe and is crime free. One of the wonderful things about Madeira is the climate. It is warm throughout the year, with the high summer months averaging 25° and the winter low reaching only 17°. This mild climate means that there are things to enjoy throughout the year in Madeira such as the flower festival in the spring and the wine harvest in the autumn. The capital city Funchal is now a cosmopolitan gem on this stunning island with a history steeped in fennel growing. This modern city is picture-postcard perfect and renowned for being one of the cleanest and picturesque capital cities in Europe. Looking out over the glimmering Atlantic coast with a dramatic backdrop of mountains, it boasts a perfect location on the south-east of the island. Funchal is a thriving city steeped in culture and history as well as being a haven for foodies and wine lovers. Enjoy a hop-on, hop-off visit of the city or visit the Contemporary Art Museum in the Fort of São Tiago, where visitors can enjoy an extensive collection of Portuguese contemporary art from the 1960s to the present day. Other things to do in the city include taking a cable car ride to Monte, visiting the statue of the famous footballer Cristiano Ronaldo or visiting the old town 'painted doors' project, which is an art installation in the old town area of Funchal. The UNESCO World Heritage site, Laurel Forest (Laurisilva) is approximately 45 minutes away from Funchal and thought to be more than 15 million years old. It is home to stunning fauna and flora and shrouded in a subtropical mist that is atmospheric and ethereal. Visitors can enjoy one of the many short or long hike trails through this beautiful forest, depending on ability. The mountain town of Santana located on the north of the island is famed for its brightly coloured houses, made from natural stone with thatched roofs. It is worth visiting the Santa Ana Chapel or taking the cable car to enjoy breathtaking aerial views over the town. Many visitors come here to enjoy the seven-hectare Madeira Theme Park, which is perfect for a day of family fun. The park is the perfect place to learn more about the history, culture and traditions of Madeira, visit a typical Santana habitat or enjoy boating on the beautiful lake. Head to the capital and take to the sea in a luxury catamaran to look for these beautiful creatures in their natural habitat. 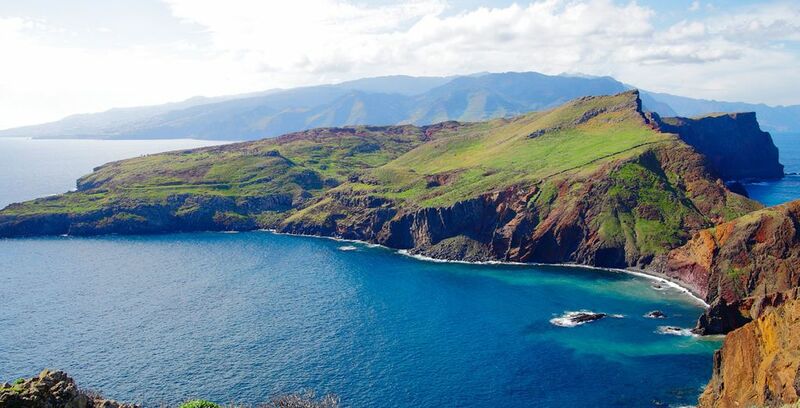 During a three-hour organised trip, it is also possible to swim and snorkel in the gorgeous and clear waters that exist here in Cabo Girão, one of the world’s highest sea cliffs. It also a great opportunity to learn about Madeira’s oceans and marine life. Opened in 1960, this stunning garden has five main sections and showcases more than 2,000 plants. This centre for culture and science has over 100 plants in the indigenous area while the tree garden displays flora from the Himalayas and tropics. The garden also has some of the rarest and exotic birds on the planet as well as medicinal tropical fruit trees and succulents from South America. Situated over 500 metres above sea level, the clifftop of Cabo Girão is the highest promontory in Europe. It is one of the most popular visitor attractions on the island and has a glass-floor skywalk with spectacular panoramic views across the bay. Located 9 miles west of Funchal, the skywalk affords incredible views at both sunrise and sunset and is free of charge. Located in the village of Monte, this lovely church can be reached via cable car from the capital of Funchal. This historically significant church is the most important pilgrimage site on the island and was originally built in 1741 on the foundations of an old chapel destroyed during an earthquake. The church, rebuilt in 1818, features a statue of Our Lady of the Mountain and the tomb of the last emperor of Austria who lived in exile here. If it is your first visit to Madeira and this part of the world, then it is well worth visiting the São Vicente caves. A tour will take approximately 30 minutes. The caves were created by the volcanic activity that actually created the island in the first place when a massive eruption occurred over 800 years ago. These caves are the largest of their kind on the island with eight tunnels spanning 1,000 metres. Explore and marvel at the crystal-clear waters of the caves and the stunning stalactites during this unique experience. Relax and enjoy a stroll through these beautiful Japanese gardens that are filled with tropical flowers, scenic rivers with bridges and an awesome collection of historic tiles. This rare collection of handmade artefacts has come from palaces, churches and chapels from across Portugal. There is also a three-floor museum with over 1,000 sculptures and minerals from around the world. The northernmost island in the archipelago is the stunning island of Porto Santo, which is renowned for its beautiful beaches and a popular place to visit. It is a paradise for walkers and nature lovers and far less populated and developed than Madeira itself. The highest viewpoint on the island is Pico da Facho where there are amazing views and a beautiful walk. Steeped in history, Porto Santo is where Christopher Columbus lived and married so there are both Christopher Columbus House and the museum to visit here. The islands of Madeira and Porto Santo are linked by a ferry crossing which takes 2 hours 15 minutes. 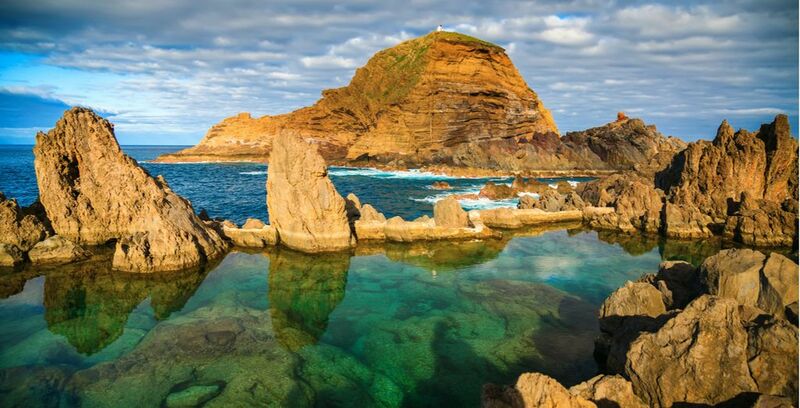 The cooling of volcanic lava left these stunning natural swimming pools in the northwestern tip of Madeira, that are naturally filled with sea water. As the salt water flows in and out, visitors are always swimming in fresh sea water. Lockers and showers have been installed, despite these being natural pools. The good news about Madeira is that the weather is good all year round. For the hottest months, visit in July and August, but for visitors who enjoy walking and exploring spring and autumn are ideal as the temperature is warm but not stifling. At this time of year, it’s still possible to enjoy over eight hours of glorious sunshine per day. Rainfall is most likely between December and February. The easiest way to get to Madeira is by plane from most major cities in Europe including London, Rome and Paris. Flights go directly into the Madeira International Airport Cristiano Ronaldo CR7, which is also known as Madeira Airport or Funchal Airport. There are limited ferry connections from Spain (Cadiz) or Portugal (Portimao). For residents of EU countries, a valid passport or identity document is required for entry into Madeira. This stunning 5-star hotel boasts a fantastic seafront location with stunning views across the Atlantic Coast. It is ideally located just a ten-minute walk away from Funchal and the perfect place to soak up the sun or to use as a base to explore the island. 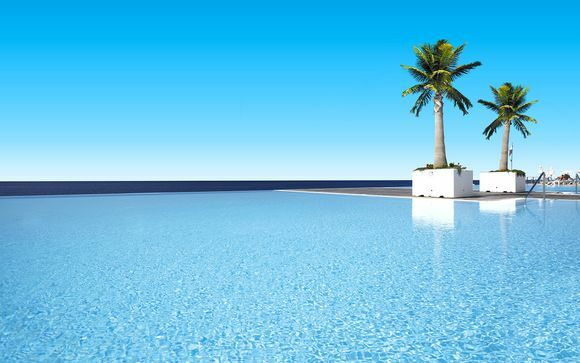 This luxurious hotel is equipped with a subtropical solarium, several swimming pools, private access to the sea, Jacuzzi, beauty salon, gym and sauna. This luxury five-star hotel is a modern masterpiece set on the cliffs with an impressive glass exterior that affords stunning views over the Atlantic Ocean. The decor is contemporary and elegant and there are three different swimming pools providing 2000 square metres of pool space, including one with whirlpool features. 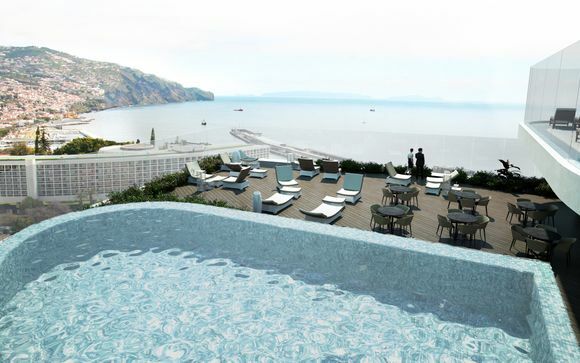 There is also a private sun deck with direct access to the sea and a THALASSO spa for the ultimate in relaxation as well as a jacuzzi, sauna and Turkish bath. If you choose to indulge in our Madeira Porto Santo Twin 4* offer, the first three nights of your stay will be hosted by this stunning oceanfront hotel. Envelop yourself in a calming, tranquil atmosphere surrounded by an oasis of natural beauty. The rooms are simplistically decorated but full of all the amenities you could need for a relaxing stay including TVs and a large private balcony. The hotel also boasts luscious gardens, tennis courts, a spacious pool, a solarium, Turkish baths, and its own path down to the golden sandy beach. 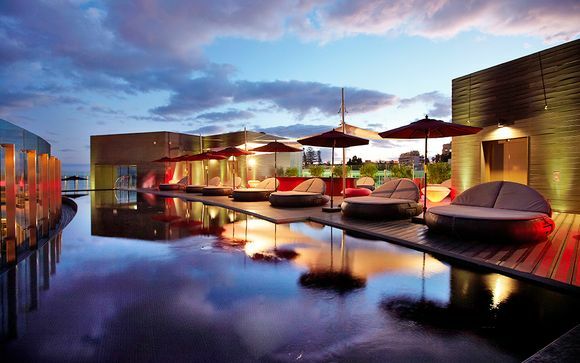 This hotel is situated just 330 yards away from Funchal's vibrant markets, and has stunning views of the Atlantic Ocean. 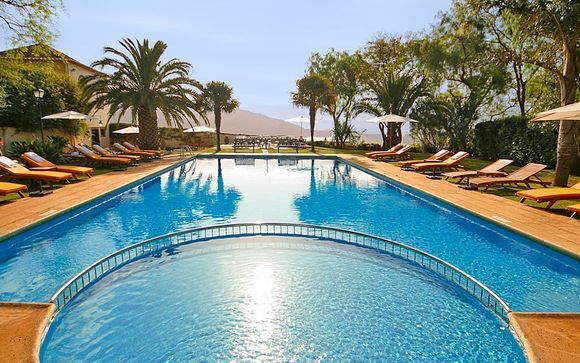 The Quinta Bela Sao Tiago was originally a traditional manor house built in 1834 as a noble family's residence, and the quintessentially Madeiran architecture is surrounded by a banana plantation and colourful orchard. 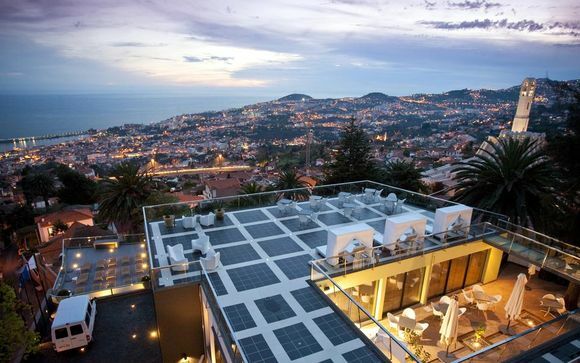 With a heated pool, cocktail bar, spa, two restaurants and breakfast served on an outdoor terrace, the hotel has everything you need to relax after exploring Funchal. 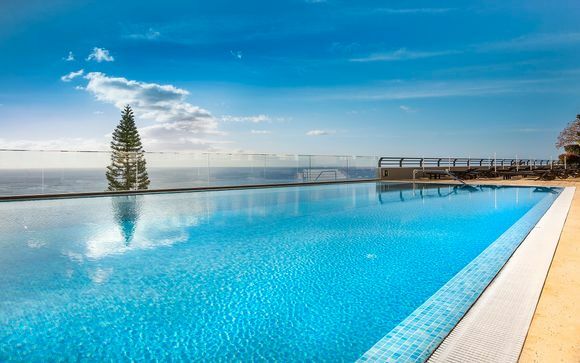 All of our handpicked Madeira hotels offer luxury accommodation at the highest standard, with stunning views and facilities to provide guests with maximum comfort and relaxation. The Carnival Festival is one of the busiest and liveliest on the island and begins with brass bands and carnival parades the morning of the Friday before Lent and ends on Shrove Tuesday. On Saturday night there is a massive procession of floats through the streets as well as singing and dancing. This annual event takes place in spring when the flowers are at their absolute best and is a real highlight on the island. Parades and floats take to the streets of Funchal to create an enchanting atmosphere, where groups of children and adults present their colourful costumes, decorated with flowers. The best things to bring back from Madeira are wine, sugar cane honey, fennel drops and sugar cane honey cakes for which the island is famous. Also traditional on the island are embroideries and cork pieces. The currency in Madeira is the euro. The time in Madeira is the same as in London, Greenwich Mean Time (GMT). What language is spoken in Madeira? Portuguese is the main language of Madeira. What to pack for your holiday in Madeira? Clothes for the ongoing summer weather, sun lotion and insect repellent are recommended for a trip to Madeira. An umbrella may be needed between December and February. A stay of one or two weeks will provide sufficient time to see many of the island’s attractions. Much of the cuisine in Madeira is influenced by the delicious flavours of the Mediterranean. Popular, local dishes include Bacalhau, which is salted cod and meat kebab. Don’t forget to try a Pastel del Nata (custard tart), which is a speciality of the island. The island is also known for its good quality, inexpensive wines. Madeira is the perfect island for walkers and those who love the countryside. Many of the hotels have swimming pools and facilities for children. The Madeira Theme Park is an ideal day out for families. How to travel Madeira with your pet? Check with your local vet and airline if you wish to take your pet to Madeira as they will be able to advise you on the necessary regulations. Madeira: What budget to plan? Madeira is in the EU and the local currency is the Euro. Like anywhere there are some high end, expensive restaurants but there are also many reasonably priced places to eat. Public transport isn’t expensive. Electrical current is 220 volts, 50Hz. Outlets will fit the Europlug, which is a round two-pin plug. There are no health risks involved in travelling to Madeira. The international access code for Madeira is +351. Internet cafes are available in most towns and resorts.